The Dowd Gallery in Cortland presents “HOMEFRONT and other works by Sarah McCoubrey,” an exhibition of McCoubrey’s new paintings in gouache on paper and butter wrappers, along with a selection of earlier drawings and mixed media pieces. The exhibition will be on view from Aug. 31-Oct. 15. Since the fall of 2014, artist and College of Visual and Performing Arts Professor McCoubrey has been in Brussels on a sabbatical leave from her teaching position. “HOMEFRONT” was influenced by both Belgium’s long history in the lace industry and its centennial commemoration of World War I.
McCoubrey was surprised by how discernible the impact of the war on the Belgian landscape and people still was after 100 years. The phrase “guns or butter,” which references a nation’s choice between investing in warfare or civilian life, came to mind and inspired her use of butter wrappers as a medium. In the “Guns or Butter” series, discarded wrappers are superimposed with lacy images of guns. 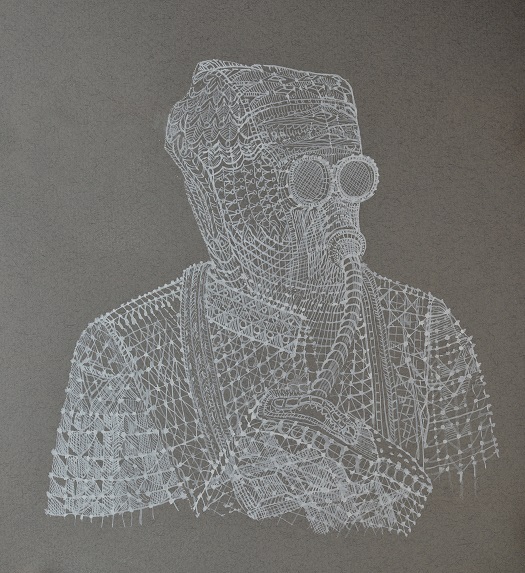 “Soldier with Gas Mask I” features a soldier donning a World War I-era gas mask depicted entirely in delicate lace. A serene and seemingly natural pond set amongst the trees is portrayed in the dainty frame of a doily in Hooge Crater, but in reality the pond fills a void that was violently gouged into the earth by a World War I mine. Previous works included in the exhibition range in date from 2012-2014 and demonstrate that human intervention in the natural world has been a theme of ongoing interest for McCoubrey. Viewing the industrial waste beds of Syracuse’s Onondaga Lake from an airplane window a few years ago, she was struck by the idea that the world’s flora and fauna might rebel and escape the increasingly toxic earth for the sky above it. The “Fate and Transport” series presents possible getaway contraptions constructed from materials such as hollowed-out potatoes and bits of human-made detritus, and the “Escape Vehicle” series captures the extraordinary flying and floating departures of the potatoes themselves. Though humans have often failed throughout history to prevent either the atrocities of war or trauma to the environment, McCoubrey’s visually playful work quite insistently encourages us to keep trying until we get it right. An opening reception will be held on Sept. 3 from 4:30-6 p.m. An artists’ talk by McCoubrey will take place on Sept. 16 at 5 p.m. A drawing workshop titled “Drawing Social Commentary” will be offered by School of Art Associate Professor Yvonne Buchanan on Oct. 1 from 5-7 p.m. The Dowd Gallery is located in SUNY Cortland’s Dowd Fine Arts Center, Room 106, corner of Graham Avenue and Prospect Terrace, Cortland, N.Y.